Exercise and walking are excellent tools for controlling Type 2 diabetes and improving health for people with diabetes. Brisk walking workouts can help you maintain a steady blood sugar level and body weight if you have Type 2 diabetes. A 30-minute walk at least five days per week is recommended by the American College of Sports Medicine and the American Diabetes Association. Learn how you can enjoy walking and manage your diabetes. 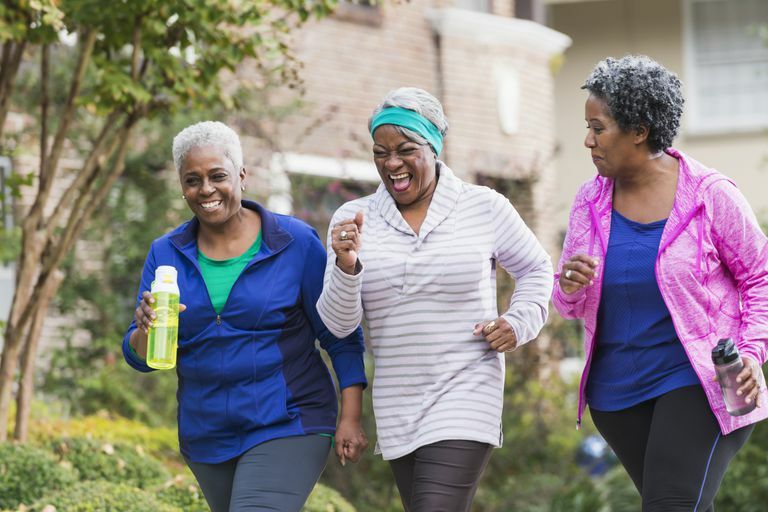 Consult your health care team to see if walking is the right exercise for you and any precautions necessary for your individual circumstances and adjustments to your medications or diet. Walking Goal: To walk for 30 minutes, with at least 20 continuous minutes at a brisk pace of 15 to 20 minutes per mile (3 to 4 mph). Walking shoes and socks: You need to protect your feet and prevent developing blisters or sores. Get fitted for flat and flexible athletic shoes at the best running shoe store in your area. Avoid cotton socks and tube socks and choose athletic socks or diabetic socks made of sweat-wicking polyester fiber. Walking clothing: You need good freedom of movement and you need to prevent chafing, which can lead to sores. Wear a fitness T-shirt and fitness shorts, warmup pants or yoga pants. Sweat-wicking polyester fabric is preferred over cotton. Where to walk: You can use a treadmill for your walking workout. If you prefer to walk outside, you should look for a walking route where you can walk with few interruptions to cross streets. Using a track at a nearby school is an option, or look for a greenway path or a park with a walking loop. Do a foot check: Check your feet before and after each walk. You may not feel blisters and hot spots, which could develop into ulcers if not treated. Get ready to walk: Prepare for your walk with a few moves to get your body ready. Stand up. Loosen up your shoulders and neck with a few shrugs and shoulder circles. Loosen up your legs and hips by marching in place for a few seconds. Adjust your posture: Posture is very important to being able to walk fluidly at a brisk pace. Take a moment to get into the right walking posture. Stand up straight, with your eyes forward and your chin parallel to the ground. Engage your core muscles by pulling in your stomach and tilting your hips slightly forward as you tuck in your rear. Now straighten up by pretending there is a string attached to the top of your head and, with feet flat on the ground, raise yourself up from your hips to the top of your head. Relax your shoulders with another couple of shrugs. Bend your arms. Now you are ready to walk. Walk at an easy pace for three to five minutes: Use the beginning of your walk as a warmup to get your blood flowing to your muscles and to continue to tweak your walking posture. An easy pace is one where you could sing or carry on a full conversation without any heavier breathing. Speed up to a brisk pace for 20 to 25 minutes: Now now want to move into a brisk walking pace to achieve moderate exercise intensity that has the best health benefits. Move your arms faster in coordination with your steps to help pick up the pace. A brisk walking pace is one where you are breathing heavier but you can still speak in sentences. You want to aim for 50 percent to 70 percent of maximum heart rate. Take your exercise pulse to see if you are in the moderate-intensity zone. Cool down for one to three minutes: Finish your walk by walking at an easy pace. If you cannot yet comfortably walk for 30 minutes at a time, you should gradually increase your time. A beginner's walking plan often starts with 10 to 15 minutes of walking and increases the time of your daily walking workout by a few minutes each week. Not Enough of a Workout? If you have difficulty raising your heart rate into the moderate intensity zone, use arm motion, and good stride to walk faster or add jogging intervals to your walks. You can also raise your heart rate by adding incline to a treadmill workout or using a route with hills and stairs for an outdoor workout. Using fitness walking poles can also raise your heart rate at a slower pace. You can also switch to cycling, swimming, or running if you prefer those activities. At the gym, try a variety of cardio machines such as the elliptical trainer, stair climber, or rowing machines. Find the one you enjoy the most or mix it up. Walkers who log 10,000 steps per day consistently are more likely to achieve the recommended amount of moderate physical activity and reduce the effects of being inactive. Wearing a pedometer or checking an activity app on your cell phone can help you be active. Sitting for more than an hour at a time raises your risks of cardiovascular disease and diabetes. Many activity monitors now have inactivity alerts to remind you to get up and move. Whether you have diabetes or you are at risk of developing it, take the first steps to improve your physical fitness. Build up to the minimum recommended exercise levels. Then challenge yourself further, as the experts say that even more exercise is better.